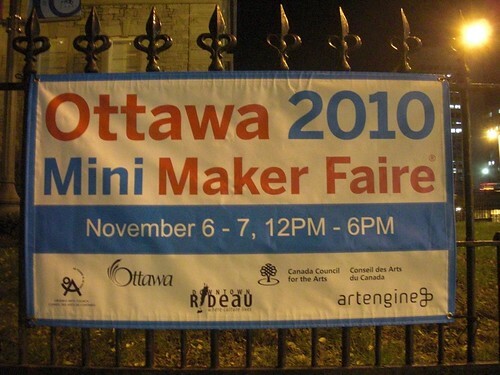 This weekend I had a booth at the Ottawa Mini Makers Faire (booth list), to show off my sensebridge stuff to a Canadian crowd. I got lots of great feedback and even managed to sell a North Paw kit to someone. I had a huge blast putting the BuzzRover (Alan, the inventor, calls it Sonar for the Blind) into people's hands and seeing how they reacted. So many people also told me that they would buy the HeartSpark, the latest version of the "pulse choker" project. It's a pendant circuit, shaped like a heart, with little LED lights that blink in time with the wearers heart-beat. So I'm more motivated than even to get that product to market. Check out my Flickr Set of the event, or better yet check out the set by Emily, one of the organizers - she had a lot more time to walk around and see stuff, I was mostly too busy talking to people at my booth!